WHO IS PETUNIA MAFIA CYCLING? 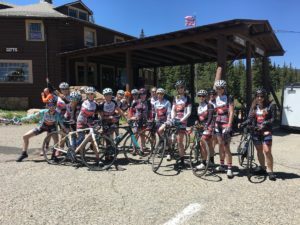 Petunia Mafia welcomes all female cyclists to join the ride! 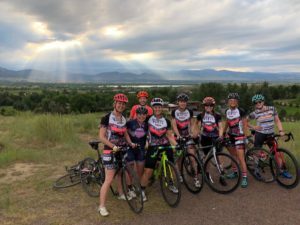 We’re a women’s cycling club based in Boulder, Colorado with members across metro Denver, the Colorado High Country, and even in multiple states. Hold on to your handlebars, we’re a lot of fun dressed in super cute kits. 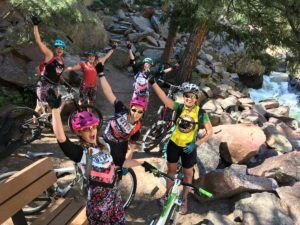 Our members are women who want to get motivated and inspired to achieve their cycling dreams through camaraderie, riding and/or racing, and miles of smiles. If you want to ride with others with similar interests and to develop your cycling skills, please join us! DO I HAVE TO BE A COMPETITIVE CYCLIST OR RACER TO KEEP UP? Heck no. Our team has a varied ride calendar to include riders of all levels, from new enthusiasts to competitive racers. We’re a group that wants to make riding fun, no matter your goal. If you already race, we’d love to have you race for us. If you’re interested in racing, we’ll help you get to the starting line. If you don’t race and won’t race, no problem! Do you want to be inspired and motivated to ride? Want to meet new women cyclists or be exposed to new routes? Do you want to wear the cutest performance kits around? Simply love cycling? If you answered yes to any or all of these, THAT’s why you should join. We’re blessed with a group of terrific women, fantastic sponsors, incredible perks, effective coaching, and the best looking kit around. ARE YOU A RACE TEAM? Nope. 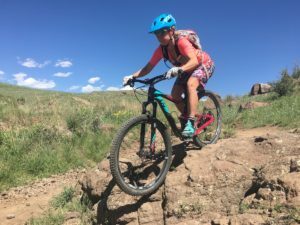 While some of our ladies love to race (our highest-participated race genre is cyclocross followed by mountain bike), most of our women are just into riding for the love of riding. And you don’t have to be a hard-core cyclist; we offer a variety of ride levels so you can pick and choose what sounds good to you. 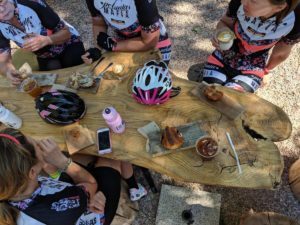 ARE YOU A ROAD OR MOUNTAIN BIKE TEAM? Both plus more. We have a solid road, mountain bike, and even a CX contingent. Each has their own ride schedule, events and leader. Many of our women have a number of different types of bikes. Gravel grinders, mountain, road, cyclocross and even tri bikes fill our garages. There’s no extra fee or separate club, it’s all one team. Hey, ho, let’s go. Nothing. No one understands better than us how busy women are without having mandatory attendance, volunteering minimums, etc. So, come as often as you’d like…but we will tell you the more you show up, the more you’ll be glad you did. Memories and connections aren’t made from the couch. 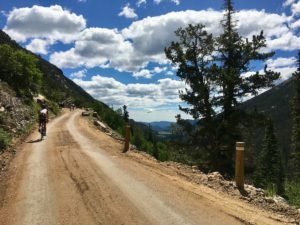 Our rides do originate mostly from Boulder County, but we shake things up quite a bit. Golden, Clear Creek County, Aspen, Fruita, and Moab are favorite destinations. If any member wants to suggest or lead a ride from anywhere on the map, we’re open to a day or weekend trip. WHEN DO WE HAVE TO JOIN? We accept new members all through the year. However, the full kit package is produced only at the beginning of the year so first come first served. Therefore we have a big membership push in January. However, you can register right now. We may have extra kit pieces on hand to purchase; team leadership will communicate what’s available when you join. Operational costs (i.e. business licenses, technology, and consultant fees), paying pro coaches for clinics, party food and event venues, etc. We spend smartly and invest in our member’s experience. To join Petunia Mafia, please click here. If you’re interested in joining us and have questions, email us at friend @ petuniamafia.com.